Companies in the networking business today like to talk a lot about software-defined networking. The basic idea is that networks should be as flexible as servers. And since a server can, via virtualization, be divided up to act like many, networking infrastructure should be similarly flexible in order to meet the more nimble needs of the modern data center. Hewlett-Packard made a big move in that direction today, announcing a series of switches that support OpenFlow, open source software that makes routers and switches programmable and thus a lot more flexible. 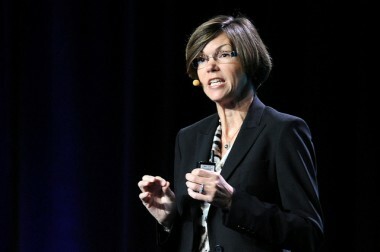 AllThingsD: Bethany, put simply, what is SDN all about, as HP sees it? Mayer: The idea is that we’re trying to create more automation, less constraint, and have the network be more abstracted so that there are few manual processes in the data center. It’s meant to bring more simplification and flexibility to the data center. In all of these products we have enabled OpenFlow. We now have 40 platforms that are OpenFlow-enabled. And we have about 20 million ports out there in the marketplace today that are OpenFlow-ready. How is the state of HP’s networking business, generally? Backward-looking, we now have 13 quarters of year-over-year growth under our belt. So we’ve continued to grow the business. Our SDN strategy is getting a lot of interest in the industry. I just recently spoke at the Open Networking Summit. The amount of interest has been very high. We had about 60 customers in our SDN beta, and they’re really excited about the applications we’ve created. No one else has created a security application, a load-balancing application, so things have been very good. And how do you see the competitive landscape? HP is a distant No. 2, but a solid N0. 2 to Cisco Systems. Do you see yourself taking business away from Cisco, or is it more complicated than that? We’ve continued to take market share in the industry over the last several quarters, and we’ve also maintained our No. 1 position as an enterprise networking vendor in China. And HP tends to play mostly in the enterprise networking space, but you don’t play in the carrier-class and telecom networking market where Cisco tends to dominate, correct? That’s correct, however I would say that with this virtual services router that we just announced, that offers us some inroads in the service provider market, because there are new capabilities they are looking for, something called network services virtualization, where they are trying to virtualize functions like routing and switching, security and load balancing. The capabilities that we’re bringing to the table with this announcement makes them very interested. This allows them the ability to move toward virtualizing their networks, and avoid the amounts of money they pay for their expensive proprietary switches and routers. Our focus for disrupting the networking industry is via open standards and simplification. That’s generating strong interest from the service providers. They don’t want to spend the money on the more expensive switches and routers. The point is to help these customers break the proprietary lock, help them make their networks more agile, and meet the new needs of their networks.